Photo/Spec's/Features Pending Sale 280FQ 29'5" 7245 $37,869. $ 7,107. $30,762. New Stocking Inventory Click each New For '07 For '08 What Can You Tow? WARNING! Photo/Spec's/Features Deluxe 2008 180W 23'11" 4180 $18,700. $ 5,705. $12,995. Photo/Spec's/Features 2008 241W 26'7" 4850 $24,300. $ 8,305. $15,995. Photo/Spec's/Features 2008 262 29' 5900 $26,000. $ 6,005. $19,995. Photo/Spec's/Features 2008 272 28'9" 5770 $28,200. $ 9,205. $18,995. Photo/Spec's/Features 2008 278 29''6" 5225 $30,500. $10,505. $19,995. Photo/Spec's/Features Order Today! 2008 4085* 39'0" 8050 $45,000. $13,050. $31,950. Photo/Spec's/Features Order Today! 2008 3986* 39'10" 8925 $52,000. $17,005. $34,995. Photo/Spec's/Features Luxury 2008 2870* 31'2" 8820 $39,711. $ 7,729. $31,982. Photo/Spec's/Features Pending Sale 219WL 25'6" 6040 $35,200. $10,201. $24,999. Photo/Spec's/Features Rampage 2007 240WL 26'7" 5375 $37,000. $16,021. $20,979. Photo/Spec's/Features Rampage 2007 243* 5170 $39.000. $13,304. $25,696. Photo/Spec's/Features 2007 260* 30'3" 5850 $40,000. $14,123. $25,877. Photo/Spec's/Features Rampage 2007 289* 29' 7875 $43,000. $18,021. $24,979. Photo/Spec's/Features Filon 2007 395* 39'10" 12050 $67,000. $27,123. $39,877. The mid-size travel trailers, in the 18-24 foot range, tow easily behind properly equipped full size cars, and are a pure pleasure when towed behind a van or pickup truck. With interior facilities depending largely on the size and cost of the vehicle, the travel trailer category opens up at around $13,000. and averages about $25,000. for a mid-size unit. Sleeping capacity varies with size, but trailers typically accommodate six to eight adults in comfort, and contain full kitchens, bathroom facilities, and the comforts of a pressurized hot water system with shower stall, of course. Model 180W, Model 190W, Model 241W Weekender. 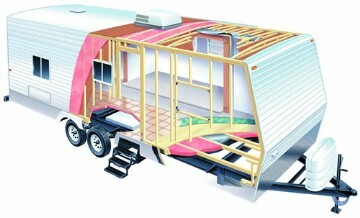 Brown's RV stocks Fifth Wheels: (See Aljo TrailRoder Ramp Trailers. All Models also available in the Nomad Line by Skyline. Aljo Limited Model 187, Aljo TrailRider Model 199 Way-Lite, Aljo TrailRider Model 219 Way-Lite, Aljo TrailRider Model 240 Way-Lite, Nomad Rampage Aljo Model 217 TrailRider, Aljo Model 243 TrailRider,Aljo Model 260 TrailRider, Aljo TrailRider Model 281, Aljo TrailRider Model 286, Aljo TrailRider Model 321. Nomad Model 187WL Way-Lite Limited, Nomad TrailRider Model 199 Way-Lite, Nomad TrailRider Model 219 Way-Lite, Nomad TrailRider Model 240 Way-Lite, Nomad Rampage Model 217 Way -Lite, Nomad Model 243 Rampage,Nomad Model 281, Nomad Model 286, Nomad Model 321 TrailRider. Brown's Recreation Center stocks or custom orders these Toy Hauler Fifth Wheels by Skyline: Nomad Rampage Model 289, Nomad Rampage Model 299, Nomad Rampage Model 337, Nomad Rampage Model 385, Model 395.Nomad Rampage. Northern California's Super Skyline RV Dealership!